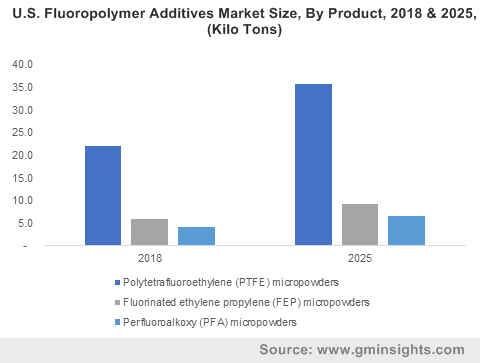 Fluoropolymer Additives Market size exceeded USD 1.2 billion in 2018 and industry expects consumption at over 200 kilo tons by 2025. Rising demand for coatings application owing to its excellent weatherability and increases time between recoats which thereby increases the exterior coatings life cycle, should drive fluoropolymer additives market size. Growing investments in architectural development along with increasing urbanization is likely to industry growth. Global buildings & construction market accounted for over USD 8 trillion in 2018, which indicates significant growth opportunities for fluoropolymers market in infrastructure development & architectural coatings. Fluoropolymer additives find wide usage in printing ink application where printing inks require additives which provide superior surface protection, defoaming, wetting and high pigment stabilization properties. Global printing inks market size is poised to surpass USD 20 billion over the forecast timeframe. Growing demand for flexible packaging along with adoption of technological innovations in packaging is likely to accelerate printing inks demand in packaging industry. The striping and printing inks used with the fluoropolymers FEP and PTFE are formulated from the resins as the substrate. The limitation for inks used to mark substrates is that they have to be able to withstand high curing temperatures. Fluoropolymer additives however experience wide price fluctuations which creates an imbalance in the supply & demand which in turn may hinder the market price trend. Increase in high-performance fluoropolymers price is due to rising raw material costs as well as investments in R&D activities to develop innovative products for various industries. Perfluoroalkoxy (PFA) fluoropolymer additives market size may witness significant gains at around 5.5% up to 2025. It has wide application usage in thermoplastics & elastomers pertaining to their light weight and enhanced performance efficiency. They are capable of being melted and reshaped multiple times making them ideal for automotive, aerospace and other machinery & equipment. Rising R&D activities along with increasing demand for high performance elastomers should fuel product demand. Polytetrafluoroethylene (PTFE) fluoropolymer additives market from coatings application may surpass USD 360 million by 2025 owing to the increasing investments in infrastructure development and growing demand for weather resistant, protective materials for exterior building parts. They provide superior corrosion and electrical resistance which enhance the exterior coatings lifespan. PTFE coatings offer high temperature resistance, low maintenance cost and non-reactivity towards several solvents & acids. Lubricants & grease market size in PTFE fluoropolymer additives may register gains over 6% by 2025 as it is used as a friction modifier which is added to lubrication oils. These products when added to lubricants reduce friction, increase the carrying loads and enhance extreme pressure performance. Most of the vehicle manufacturers are relying on fluoropolymers which exhibits superior performance properties as these provides resistance against heat, chemicals, and corrosion. Also, PTFE based greases have low friction, longer usage life than conventional grease, and wide range of operating temperature. North America, driven by Canada, Mexico, and the U.S. fluoropolymer additives market size should surpass USD 800 million by 2025 owing to the growing demand for printing inks in the region. Most of the companies are offering wide range of high viscosity marking inks for PTFE fluoropolymer wire applications, which are creating avenues in the printing inks industry and thereby boosting the market size. Europe fluoropolymer additives market demand led by Germany, UK, France, Italy may anticipate gains close to 5.5% in the forecasted timeframe. Increasing demand for light-weight thermoplastics in automotive industry pertaining to their superior properties such as electrical antifriction and weather stability will stimulate the regional market growth. Replacement of metal components with thermoplastics significantly enhances efficiency and minimizes fuel cost. Rising environmental concerns for carbon emissions along with increasing consumer awareness for thermoplastics should boost the fluoropolymer additives industry demand. Asia Pacific, led by India, Japan, and China fluoropolymer additives market size may register significant growth over 6% by the end of 2025. The region has witnessed significant increase in demand for residential and commercial buildings which has boosted the paints & coatings industry. They are used in infrastructure coatings pertaining to their durability, weather resistance and economic feasibility. 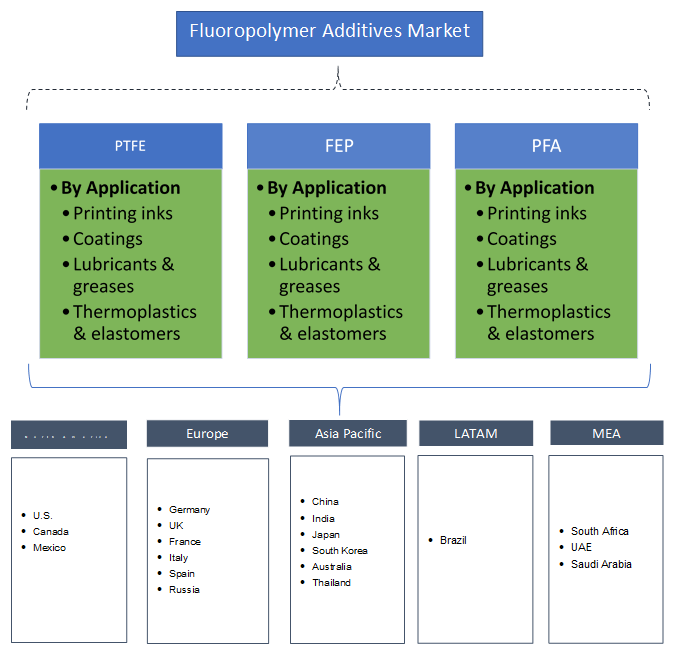 Global fluoropolymer additives market share is consolidated among various market participants such 3M, Dakin Industries, Solvay, Micro Powders, Asahi Glass, Maflon SpA and Shamrock Technologies. Manufacturers are majorly focusing on processing of new innovative products to expand their product line and engage new customers. Also, most of the industrial participants are expanding their regional reach and focusing towards acquisition to augment strategic business line. Fluoropolymer additives is widely used in lubricants & greases, coatings, printing inks, and thermoplastics pertaining to its superior properties. Most of the fluoroadditive powders are primarily designed for usage in mixture components with other liquid or solid materials. They are designed to enhance the corrosion resistance, abrasion resistance, reduce surface contamination, modify appearances, and reduce frictional coefficient & mechanical wear.